The Segl is a new ultralight hammock from Amok, a company known for their unique hybrid hammock, the Draumr. In contrast, the Segl is a simple, open, gathered-end design using lightweight ripstop nylon fabric with a single panel design. The hammock comes complete with a full suspension system included in the price. The suspension is a common cinch buckle hardware and strap. The stuff sack is attached to the end of the hammock, near the gathered and and cinch buckle on one side. Included with the strap are a pair of slim wiregate carabiners attached with loops on the end of the webbing. Removing the webbing is easy. Easy pull tab for quick release. Stuff sack attached on the end. Watch for twisting webbing.This will send you down to the ground fast. Watch for sap on your straps. Close-up look at the strong nylon fabric. Close-up view of the stitching. The entire kit—straps, buckles, carabiners, and hammock—weight a remarkably light 15 oz (425 g)! Cinch buckles are a pretty common hammock suspension hardware system, but Amok is one of the only companies I’ve seen who really set it up to be very user friendly. For example, when a cinch buckle is tightened, it can be somewhat difficult to loosen. Amok has added a pull tab on the cinch buckle that makes releasing the strap simple, even when it is cranked tight (not recommended). The downside to cinch buckles, however, is that if there is any twist on the webbing at the buckle, it can easily slip. Ironically, this happened to me while I was testing — even a pro can make a mistake! A careless set up was all it took to put me on the ground. The precaution here is to always inspect your webbing and make sure it is fed flat through the buckle and is not twisted. The metal slider should rest flat against the webbing. If the slider is angled, it can also cause the buckle to fail. The hammock comes with the straps already attached to the hammock. This makes set up extremely easy since all you have to do is wrap the carabiner end around an anchor point and go. The downside is that some anchors—pine trees for example—can have sap and goo that will gum up the straps. I hate to pack gunked up suspension with my hammock. The good news is that it is easy to remove the webbing straps from the hammock if necessary. The hammock is generously proportioned and has a nice lay. The lighter fabric is more stretchy, but it still provided a stable bed. I enjoyed many nights of slumber in the Segl. It’s no secret that I prefer hammocks with a single panel design. Popular hammocks like ENO and Grand Trunk (and their innumerable copycats) use three panels of fabric with seams that run the length. These seams introduce uncomfortable bulges in the fabric that become noticeable behind your head, shoulder, and legs, depending on how you lay. Single panel hammocks not only avoid these issues, but also allow the entire width to be used that helps relax the fabric especially around your legs to reduce leg ridges. It’s a simple design choice that has a lot of positive use benefits, even if it lacks some aesthetic benefits. This hammock packs down so small, it’s a great companion for hikes, picnics, backpacking trips, or lightweight adventures. It’s the base for a very modular system. Update 9/17 – I have been taking the Segl with me in my day bag nearly everywhere, including business trips where I’ve been lucky on occasion to set it up in hotels and for breaks. 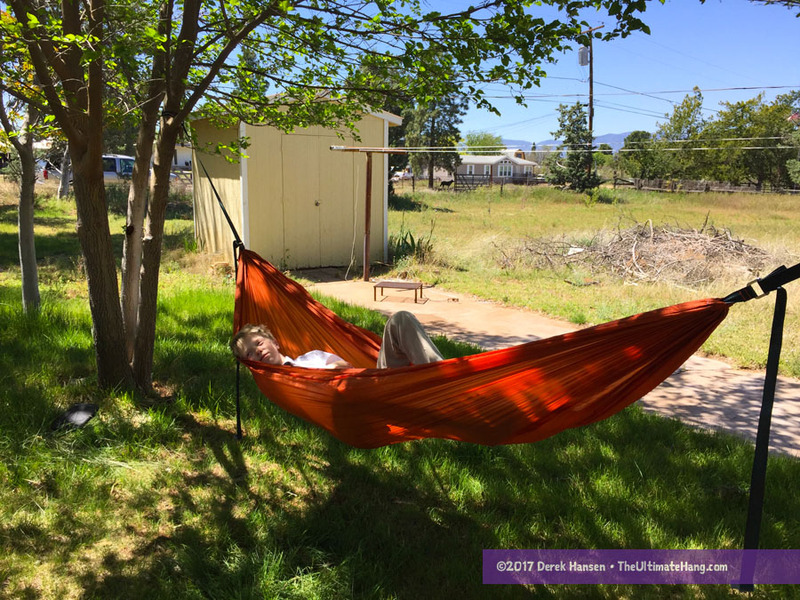 The inclusion of the suspension system and easy-to-use cinch buckle hardware makes it easy to set up and I don’t have to worry or think twice about whether I have everything I need to hang the hammock — just grab the bag and go. With most open hammocks costing between $65 and $100 plus the extra cost of a suspension system (a common daisy chain suspension with carabiners can cost between $30 and $40), the Segl really becomes and competitive hammock option. Suspension and Anchor System ♥ ♥ ♥ ♥ ♥ The hammock includes high-quality carabiners, straps, and webbing strap/suspension lines. Construction and Craftsmanship ♥ ♥ ♥ ♥ ♥ Tight, even stitching. Generous hems. Modularity ♥ ♥ ♥ ♥ ♥ Perfect example of a highly-modular base hammock. Aesthetics ♥ ♥ ♥ ♥ ♥ Available in multiple single-color options. Price and Value ♥ ♥ ♥ ♥ ♥ Well-priced for a hammock and suspension combo. Imported. Great review. I been eyeballing this to go with my Amok Draumr 3.0. I love their suspension setup. I had a trip in Hawaii which rained for 6 days strait while in my Amok. Never got wet and from the 7th day on it was all sunshine. Always slept good! They have an awesome water brake setup. I don’t know 🙂 I’ve been pronouncing it like “seagull”. What weight can the hammock hold? Ah! Good catch. The rating is listed as 330 lb / 150 kg. I’ll update the review.